A second member of the captured Royal Navy crew has apologised for trespassing in Iranian waters. 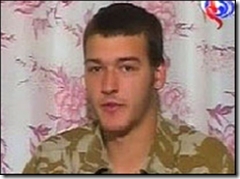 The "confession" by a crewman, named as Nathan Thomas Summers by Irna news agency, was broadcast on Iranian state television. "I would like to apologise for entering your waters without any permission. "I know it happened back in 2004 and our government promised that it wouldn't happen again. "Again I deeply apologise for entering your waters."